At Julian Turner Garden Services, we offer first class Garden Maintenance in Newbury and the surrounding villages of West Berkshire. Our fully trained gardeners have over 60 years of horticultural knowledge. With our personalised garden maintenance schedule, we will care for your garden thoughout the year, so you can spend more of your time simply enjoying your garden. 01A member of our friendly staff will contact you when we receive your enquiry, to arrange a convenient time to meet. At our meeting we will discuss your needs, goals and budget. 02We will build you a personalised garden maintenance schedule tailored to your requirements, for you to approve. 03Your first visit will then be booked. 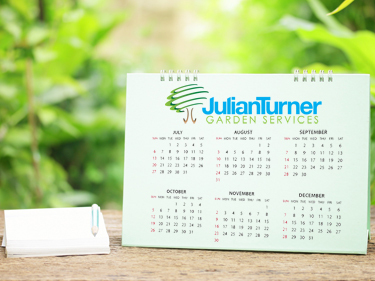 Why choose Julian Turner Garden Services? We are the region's premier Garden Maintenance company. As a family business established in 1999, we are very committed to giving a first class service and we believe our customers deserve the best. Our gardeners are passionate about what they do and always happy to discuss your garden and offer advice.